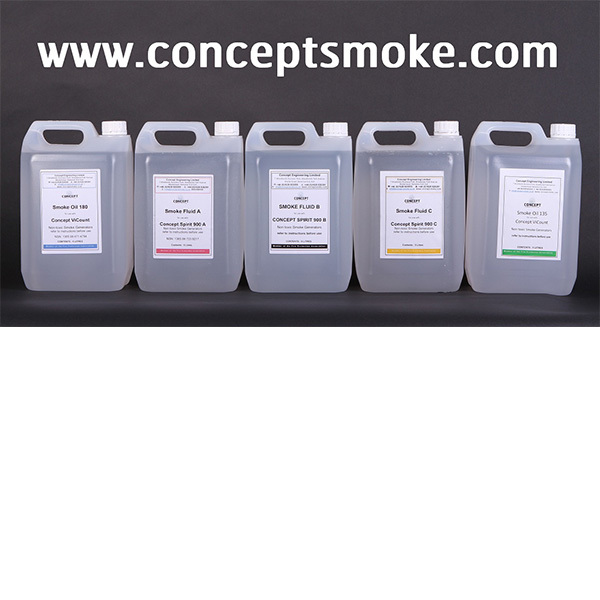 Concept have a range of oil based fog fluids that offer different characteristics to water based fog chemicals. These oils comply with the requirements of USP FDA 178.3620 (a) and 172.878 USP mineral oil specifications. Using Fog Oil 135 or Fog Oil 180 in the ViCount or Vulcan fog machines will create a fog effect that is up to 10 times more persistent than theatrical fog machines. Oil based fog fluids can also offer significant improvements to the fogs resistance to high temperatures. Concept’s Fog Oil 180 is used world-wide in some of the largest hot fire training facilities because it creates a fog resistant to temperatures of almost 400°F. Other advantages of using oil based fog chemical include lower running costs, safer fog & cleaner fog. Fog oil 135 is for use in some ViCount’s (depending on configuration) and also the Artem smoke Gun (refillable fog canisters). Fog Oil 180 is for use in some ViCount’s (depending on configuration) and the Vulcan fog generator. Fog Oil 180 offers a higher temperature resistance so is the recommended fog fluid for hot fire training centres, or any application where fog may be exposed to elevated temperatures. Concept Smoke Systems only recommend and guarantee the use of our own fog fluids in our fog machines. The use of non-recommended fog fluids can lead to poor fog quality, residue after use, potentially toxic smoke and voids all warranties.